X-Ray Inspection can be an effective, non-destructive inspection tool. This form of interactive analysis provides internal viewing of an assembly’s design, internal components, workmanship and potential latent quality issues. Digital X-ray technology has added a new dimension to X-ray inspection that extends beyond traditional film-based cabinet type technology, including the use of specially devised algorithms for void analysis. The term “digital” in digital X-ray service refers to the technology of image acquisition where the data is collected or transferred to electronically stored media. Digital Radiography detector technologies such as Image Intensifiers and solid-state panels can vary in size and pixel counts. Digital radiography-based systems can offer the ability to view a sample while manipulating magnification, X-Y directions, rotation, tilting and exposure. This is referred to as real-time radiography. The advantage over traditional cabinet X-ray inspection is the improved imaging at magnification and the ease of image optimization. 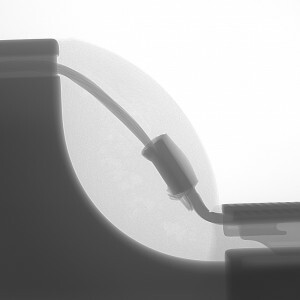 Actively inspecting a device under manipulation is known as real-time X-ray inspection. Real-time X-ray systems can be equipped to mechanically rotate a device in steps through a defined angular sequence while collecting individual exposures. 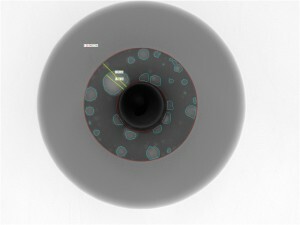 The exposures are assembled into a 3-dimensional model where thin slices of the device can be generated and viewed, or stitched into 3D renderings referred to as Computed Tomography or CT-Scans. ORS Inc. has three digital X-ray systems from the leading X-ray manufacturers, each with unique platforms and technology, allowing versatility to provide the best possible inspection of your devices. 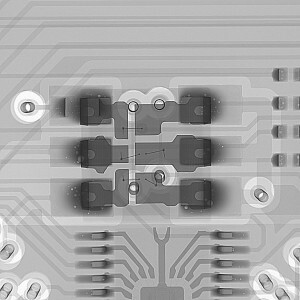 ORS has over 30 years of experience providing X-ray radiography services to the microelectronic, semiconductor and PCBA industries. ORS X-ray inspection is DLA suitable for Mil-Std 883 TM 2012 and Mil-Std 750 TM 2076 Radiography inspection.